Photo via online property listing. Delaware once served as a vital link in one of the coups that formed pre-bailout General Motors, but with the announcement late last month of the pending demolition of the former GM Wilmington assembly plant, the wrecking ball will also remove the state’s last remaining connection to the carmaker. Though built in 1946, the assembly plant has a history that dates back to 1914, when Pierre S. du Pont first bought stock in General Motors. While GM chugged along under the control of the bankers who ousted GM founder Billy Durant since 1910, du Pont’s main goal in buying stock — and later rising to chairman of the board at GM — wasn’t merely to strengthen GM’s management and ensure continued profitability, according to Lawrence R. Gustin’s biography, Billy Durant: Creator of General Motors. Instead, Durant laid claim to having convinced du Pont to invest in GM in the first place, and in the summer of 1915 du Pont reportedly agreed to help Durant leverage the latter’s purchase of Chevrolet into regaining control of GM. “It was agreed that the du Ponts would join on a fifty-fifty basis in Durant’s program of regaining control of GM provided they could acquire enough stock at the right price,” Gustin wrote. Rather than Michigan (or New Jersey, where he first incorporated GM in 1908), Durant chose to reincorporate General Motors in Delaware. Gustin notes that du Pont claims not to have met Durant until later, and it’s conceivable Durant chose Delaware entirely based on its tax laws, which have historically been favorable to corporations founded there by out-of-state residents. However, du Pont, whose family history is intricately intertwined with Delaware’s, likely had some say in the choice as well. 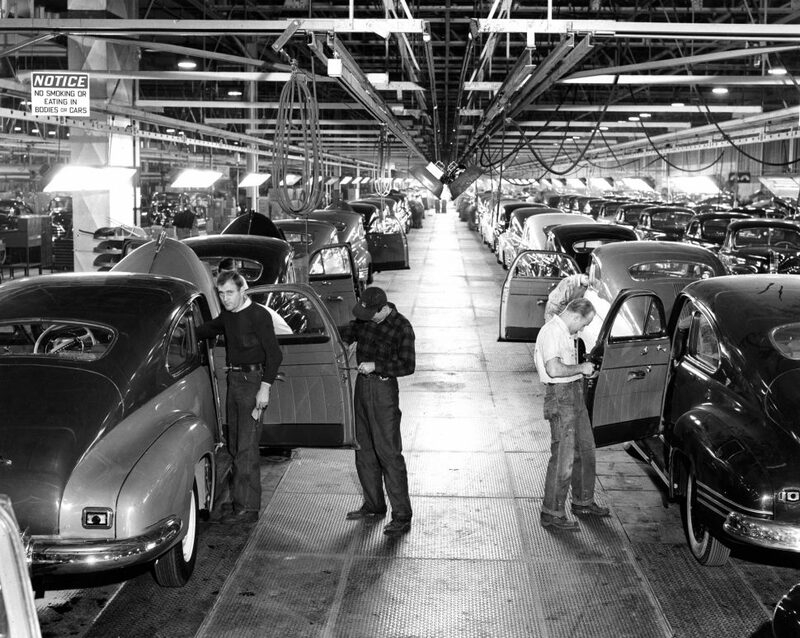 After all, as the Wilmington News-Journal noted in 2009, DuPont the company owned “nearly a quarter” of GM when the latter announced in 1945 that it would for the first time build a new assembly plant on the East Coast, on Boxwood Road just west of Wilmington. Photo via Delaware Historical Society. The plant, initially built to assemble Buicks, Oldsmobiles, and Pontiacs, rolled out its first product, a 1947 Pontiac not long after construction. Over the years since, it churned out everything from Chevrolet Impalas to Chevettes to Eighties L-body cars to Saturns, though not continuously. Reggae legend Bob Marley even once spent some time driving a forklift in the plant (though some sources maintain it was a nearby Chrysler plant). 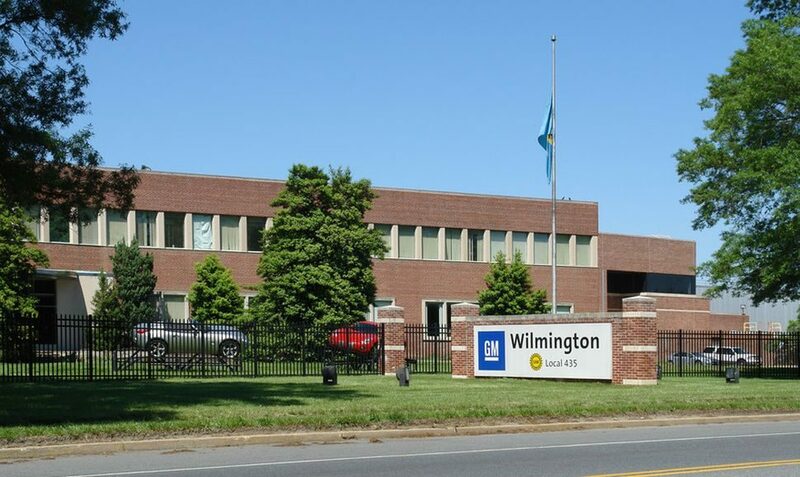 In 1986, the Wilmington plant temporarily shut down to retool, then in 1992 it appeared that GM would shut the plant down for good, only to reverse its decision four years later. While other plants and facilities that GM shuttered in its 2009 bankruptcy took years to sell (or, in a handful of cases, remain unsold today), the Wilmington plant found a purchaser in 2010 when Fisker Automotive bought the site for $20 million. Fisker, which had announced $175 million in improvements to the plant, then went bankrupt in 2014. Rather than occupy the location, Chinese car parts manufacturer Wanxiang, which bought Fisker’s assets, then sold the site in 2016 to developer Harvey Hanna, which has since announced plans to redevelop the site into 3-million square feet of warehouse space for shipping centers for online retailers. According to the Delaware Business Times, Hanna’s proposal calls for the complete demolition of all the dormant buildings on the property, beginning in late November. “As much as the hope drained away when GM left that plant, and as much as it crushes us with the job loss, we’re now filled with hope and opportunity knowing there is going to be a new story in our county,” New Castle County Executive Matthew Meyer told Automotive News earlier this year.